Holstering my gun and putting extra ammo in my backpack, I grabbed my students’ homework, a couple of textbooks, and my computer. I was off for another day at school. “And it is not who we will allow ourselves to become.” I love that line. We have a choice: we can choose be afraid and amass weapons, or we can take a deep breath. I have no intention of arming myself. Like Governor Malloy, I will not allow myself to live in fear. In the January 12 New York Times, reporter Michael Cooper wrote of gun control in an article titled “Sale of Guns Rises in US.” A couple of statistics caught my attention. A gun shop owner in Iowa said that the price of a 30-round magazine had increased five times its price listed only months ago. Last month, 2.2 million background checks were in line for processing. That number is a 58.6 percent increase over the same month in 2011. Closer to home, I’m looking at what local readers call The Shopper. More formally, The Thrifty Nickel is called American Classifieds. I’m looking at the shopper for Greater Pueblo Colorado, dated January 10, 2013. It a free, fire-starter-paper advertising sofas, tack repair, cars, cemetery plots, radial arm saws, fancy peafowl and bed bug extermination. If neither of these dates work, you can find guns at Curran Firearms, 2648 Santa Fe Drive, Suite #7. One individual has a .257 Weatherby Magnum Mauser action with 3×9 Redfield scope and shells for only $800. Another person has a Hakim, 8MM Mauser, semi-automatic rifle plus 300 rounds of ammunition, very nice condition $700. If you are interested in carrying a concealed weapon, you have choices. You can either attend a weekly class and pay $60. for Citizen Self Protection Training. 719-242-6214, or a second choice would to attend a class on January 23. The ad promises “certified instructors.” 719-250-0309. http://www.coloradohandgunsafety.com. I don’t know about you, but reading these ads does not make me feel safer. 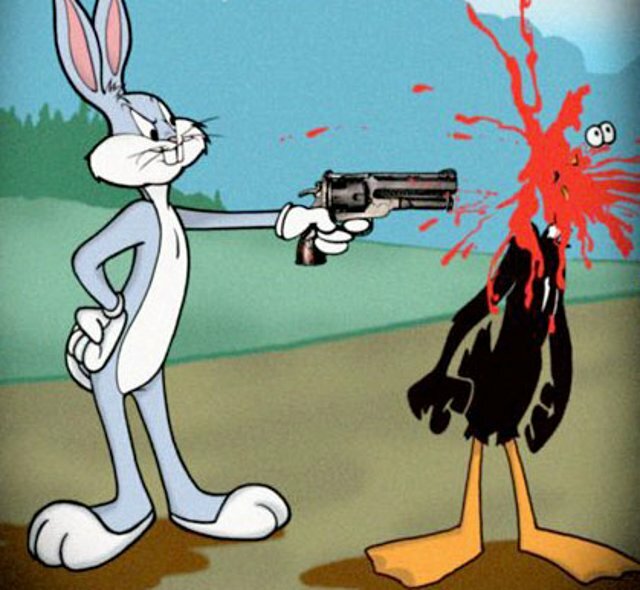 Even Bugs Bunny fails to amuse me. If you were a member of Congress, what solutions would you promote? Write a short piece in which a gun plays a part. This entry was posted in Uncategorized and tagged Dannel Malloy, Gun Control, Michael Cooper, writers' prompt. Bookmark the permalink. Driving Down-Below from Wetmore to Pueblo, I pass a concealed handgun training building – I think that I need to take the class, not because I will ever carry a concealed gun, but because I want to see for myself – the tone of the instructor, the other participants, and the nature of the course. Watch for the blog. Dear Jennie, Thank you for writing. Do I know you? I gather that you do not live in the United States. It is gratifying that as a people we are interested in other cultures and look for information aside from the news media. Prior to joining my husband who was working in London in 2002, I asked the editor for whom I worked here in the States, if I could continue to write my column and email it to the paper. He wasn’t keen. His comment was that The Wet Mountain Tribune was a small, local paper and no one was interested in life on the far side of the Atlantic. I countered with suggesting that I email my columns for a couple of weeks and depending on feedback from readers, I would continue to mail my columns or if readers complained, I would go away quietly. The editor caved in. I wrote my columns from London for a total of eight years. Readers loved reading my impressions of life in the U.K. and in Europe. It is all about coloring inside the black and white lines.